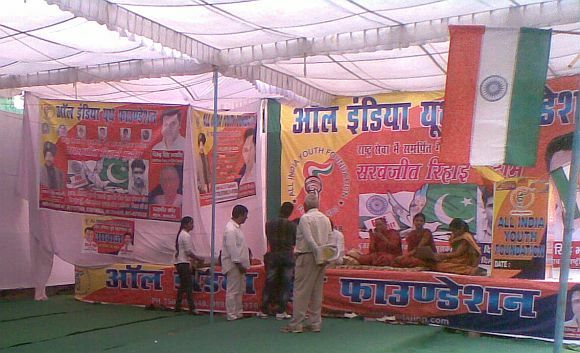 Once the centre of political and media buzz when social activist Anna Hazare was protesting for the Lokpal Bill, Jantar Mantar -- located in the heart of national capital New Delhi -- looks deserted these days. The favourite spot for protestors, who converge at the venue from across India, is today witnessing the remarkable struggle of a sister who has been seeking the return of her brother from a jail in Pakistan. 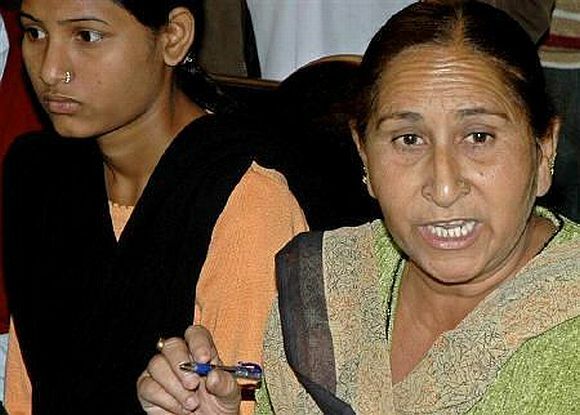 In her mid-forties, Dalbir Kaur is trying to push the Indian government to secure the release of her brother Sarabjit Singh, who is on a death row in Pakistan and has been languishing in Lahore's Kot Lakhpat jail for over 20 years. The protest entered its second day on Saturday. Accompanying her are Sarabjit's daughters Poonam and Swapandeep. Younger daughter Poonam was only 23-days-old when Sarabjit was arrested for his alleged involvement in the serial blasts in Lahore and Multan that claimed 14 lives. Elder daughter Swapandeep was about two-and-a-half years-old then. Dalbir last met her brother in July this year. "I had also met human rights activist Ansar Burney and many others. They all assured me that Sarabjit would be released, as this would better the relations between the two countries," Dalbir said. But would sitting on protest at Jantar Mantar help Saranjit's cause? Dalbir and her daughters hope so. "The response has been encouraging. Virender Singh, president of All India Youth Foundation, is supporting us and is fasting till November 21. If nothing concrete happens till then, we will continue our protest," Dalbir said. She further said, "Lok Janshakti Party chief Ram Vilas Paswan saw us today. I am hoping to see many political leaders in the days to come. All-India Anti-Terrorist Front Chairman Maninderjit Singh Bitta and Congress MP Sanjay Nirupam would also be visiting us soon. Hence, I am very confident that something will happen this time." 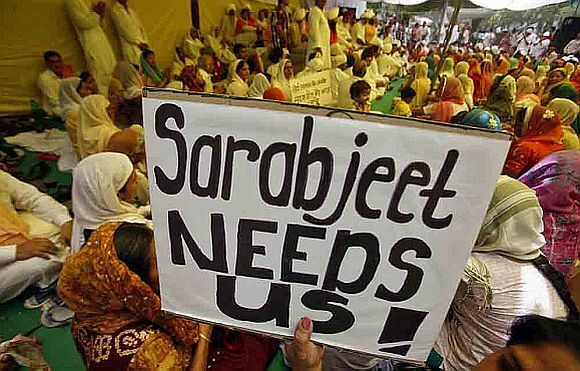 Sarabjit's family and lawyers claim that his arrest was a case of 'mistaken identity'. His daughters had the first chance of meeting him in 2008. Recalls Swapandeep, "Though we have been longing to see our father, I never thought we would be seeing him like that, in Pakistan. We always thought we would see him at our home, in our village, in India." Their native village, Bhikhiwind (district Tarantaran in Punjab) is just a few kilometers from the border. 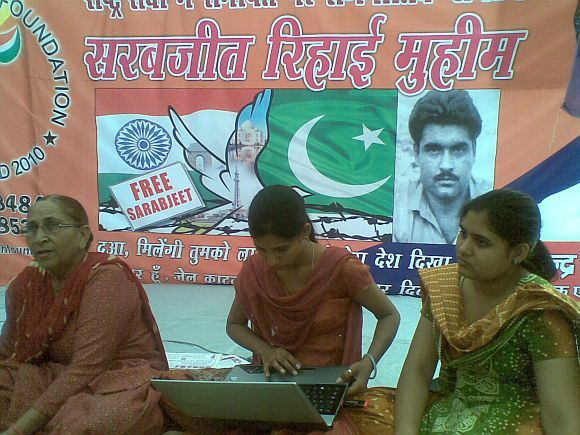 The family claims that Sarabjit was arrested after he had accidently strayed into territory belonging to Pakistan. Dalbir has spoken to countless politicians, humanitarian workers and government officials from both countries over the years, hoping to see some action being taken. "I had met Rahul Gandhi on February 24 this year, and he had promised me he will do something," Kaur says, with an unrelenting flicker of hope in her eyes.